Welcome to the New Year and welcome to the new addition to our Quick and Carry Kitchen – the Ninja Foodie! This is THE perfect recipe to do with a Foodi, because of the broiler built in…you simply make the meatloaf under pressure and then use the broiler setting for 8-10 minutes to perfect the ketchup topping and get the meatloaf finished the way you like it. I have to give a HUGE shout-out to Laura at AweFilledHomemaker.com for the great process for cooking this meatloaf. You can use her recipe, my recipe, any recipe – but using her process really makes sense. Thank you, Laura! 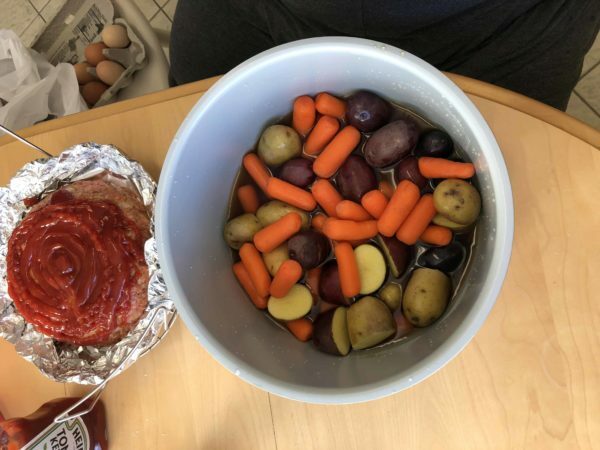 Prepare whatever veggies you want – I went with carrots and new potatoes – and put them in the bottom of the liner. Pour in 1 1/2 – 2 cups broth – can be veggie, beef, or chicken, or even just water. Make the meatloaf mixture in a medium bowl and use the bottom of the bowl to pack the contents into a nice bowl shape. Take two pieces of tin foil and criss-cross them in front of you. 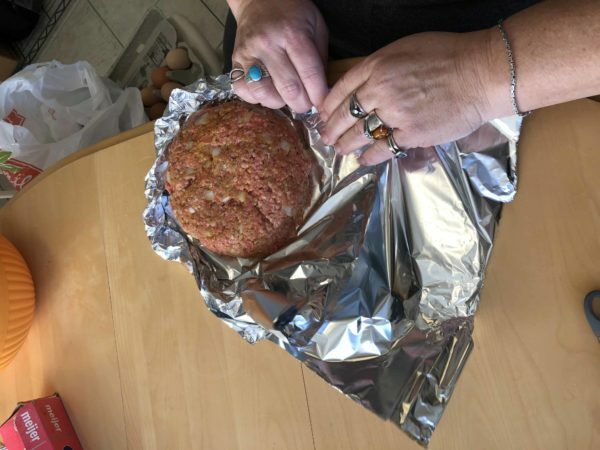 Dump the bowl of meatloaf right into the center of the foil, and use your hands to shape and perfect the loaf. Turn the edges of the foil, as you would a pie crust, and create a shallow pan around the meatloaf. Set this little pan onto a trivet and top the meatloaf with ketchup. I had a squeeze bottle so I just decorated it like I would a cake – round and round with ketchup until it was filled in on the top. Then set the trivet and meatloaf into the liner on top of the veggies. Lock on your lid and you are good to go. Pressure cook for 35 minutes. Once the pot is done cooking, do a quick pressure release and take the meatloaf out of the pot. Take the whole little foil pan and put it on a cookie sheet and place in a hot oven, under the broiler, for 8-10 minutes. If you have a Foodi, you can do the finishing right in the miracle machine. Prepare the vegetables and place in bottom of Instant Pot liner. Cover with the broth. 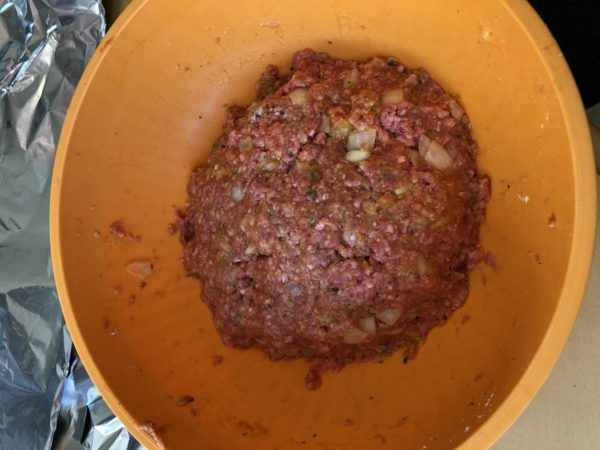 Prepare the meatloaf in a medium bowl, combining all the ingredients and then shaping the ball of meat into the shape of the ball. Take two 12-14 inch pieces of tin foil and lay them in a criss-cross. Dump out the meatloaf into the center of the foil and finish shaping the loaf. Roll up the edges of the foil to create a little sided pan. Place this pan onto your trivet, or use a sling of foil, and place on top of the vegetables in the pot. Lock on the lid and set manual/pressure cook to 35 minutes. When done cooking, do a quick pressure release and then take the meatloaf out of the pot. 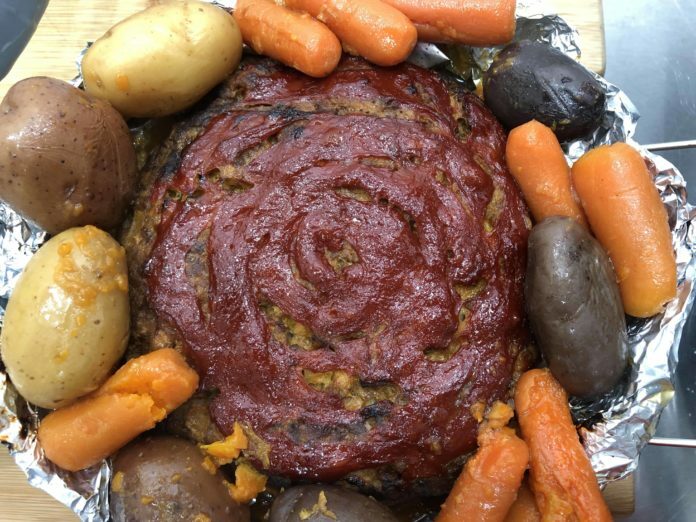 Place the foil "pan" of meatloaf onto a cookie sheet and place into the oven with the broiler on high. Cook for 5-10 minutes until the meatloaf is finished to your liking.